Your choice of meat, two pita breads, tomatoes, onions and extra tzatziki sauce served with Greek salad and your choice of rice or fries. Seasoned meat served with onions, tomatoes and tzatziki sauce. Includes fries or salad. With green and red peppers, tomatoes, onion, lettuce, cucumber, feta cheese, and tzatziki sauce. Includes fries or salad. 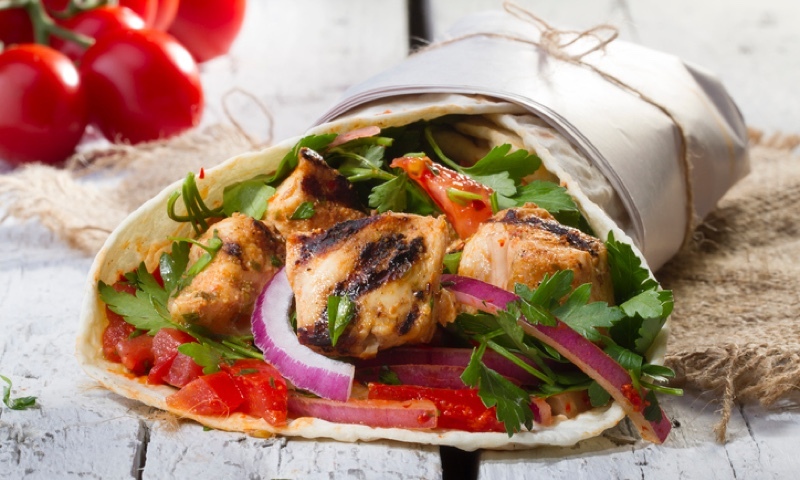 Marinated chicken breast with onions, tomatoes and our homemade lemon-mustard or tzatziki sauce. Includes fries or salad. This place is awesome. I ordered a Gyro Picado with salad and a side of tzatziki sauce and a friend wanted an order of corn fritters. The gyro's here are packed full of meat, almost laugh out loud too much when you unwrap it for the first time. I've never gotten the Picado before and it hit the spot. I wanted something a little spicy, plus I used a side of tzatziki sauce which went great with it. The salad was huge and great as usual. You have to be very hungry to finish an entire gyro, I saved half for dinner. The corn fritters itself were just ok while the honey flavored sauce served with it was amazing as my friend let me have a few. She didn't expect them to be sweet and I had never ordered them before but it was a nice surprise. In short, lots of really good food, great prices and they have been consistent for me! I've been going to George's for many years. The food is always great. The service is always great. And I can't think of any criticism. On a side note, the girl who works the counter for the last couple of years is A-1. She juggles the phone, the customers, and the dining room. And always with a smile on her face. Which is not much of a surprise; I've met George and see he's a cool cat. He obviously takes care of not only his customers, but his employees. That's how you build loyalty. My wife and I ate here for the first time the other day. Food was ready in 20 minutes which was actually faster than the estimate the site gave us. We had the chicken ceasar pita and the greek club, she got the fries I got the salad that comes with it. Everything tasted awesome and like a couple of people already said the salad was awesome! Great dressing! Will definitely eat here again. The food is absolutely great! And the value is the best in town as well. I got a gyro platter that had a generous amount of meat, large helping of fries and a nice Greek salad and 4 half pitas. This is my favorite place in town for Greek food and I feel I really get my money's worth! We love George's!!! We've really enjoyed everything we have tried. We love the variety, quality & care taken into preparation. Wrapping up the gyro when I had a salad inside the container was really thoughtful... I get to eat my salad the next day. ;) Thank you & happy holidays! Order your George's Famous Gyros (McKellips Rd.) favorites for takeout, and we'll make sure your food is wrapped and ready when you get here.